Metal maniacs, rejoice! 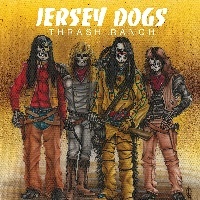 I am proud to present to you: JERSEY DOGS; signed via Heaven And Hell Records, hailing from the United States of America - performing Thrash Metal, on their debut reissued album entitled: “Thrash Ranch” (released and reissued in 2018). Since formation in 1980; the quartet in question have an EP entitled: “Don’t Worry, Get Angry” and a Demo and this here album: “Thrash Ranch” in their discography so far. 10 tracks ranging at around 50:04 (for the record); the band arrange an intricately designed formula of hard-hitting old school Thrash Metal distinctions, the startling introduction that is “Posse Of Doom” begins the record until the battering and rampaging stampede of “Medicine Man” opens the chaotic mayhem with galloping chugs and distinguished melodies that pound persistently with relentless ramifications. The band demonstrate concrete slabs of solid stability in which thunderously thumps with a grandiose manifestation of gritty contrast and excelling adrenaline- fuelled aesthetics. For a Thrash Metal record, this is also an interestingly long one which is quite unprecedecented. Consisting of Louis Ciarlo on bass & vocals; the frontman distributes a consistent barrage of clean pipes with a hint of raw roughness as I jam to “Why Is”, the man delivers a boistrously complex dynamic of flamboyancy and energertic strumming. Dextrous guitar duo Jon Ilaw & Mike Benetatos efficiently riff with blistering fire in the crushing “Blood From A Stone” & “Who’s To Blame”, showcasing a uniquely conposed and organic substance of progressively modern technicalities that show JERSEY DOGS were way ahead of their time in this sub-genre. Advancing to “Wasted World; the band dominately strive with more diverse variety, providing vehement pummelling from powerhouse drummer Michael Sabatini who hammers away with slamming savagery and skill. “Games” embellishes on detailed finesse with conceptual songwriting while assaulting with amplified heat that will make anyone break chairs over other chairs; implementing inventive hooks that elements hardened hymns in which effectively generates meticulous rhythms with a borderline, punchline foundation of fabricated grooves - similarly profound in the entertaining yet enjoyable “Greasy Funk Chicken” (which is a great party song!). “Last Breath” conveys a cinematic characteristic, differentiated with razor-sharp nimbleness which is flourished with a fluidly polished sound production craftsmanship (also found throughout the record of course). I then stumble across the creative “Another Pretty Day”, enlightened with fulfilling charges of full-throttle enjoyment - deadly stuff despite the title! With that; I realise that that was the debut full-length record, and the 2nd portion being their 1st debut EP ever released with 5 tracks that range from around 23:48 entitled: “Don’t Worry, Get Angry” - which adds 3 Demos of “Wasted World, “Who’s To Blame” & “Another Pretty Day”. They are aggressively accerlating versions that bash ‘n’ thrash with riveting proficiencies, and an explosively eccentric cover of the epic “Dirty Deeds, Done Dirt Cheap” by AC/DC - which is a magnificent version of this fun and energetic song, bringing me to my attention with captivating brilliance. Overall concluding the bundle with another great cover from VAN HALEN with “Sombody Get Me A Doctor”; I was very surprised with this discovery, as a metal thrashing madman – JERSEY DOGS certainly outdone themselves with “Thrash Ranch”, go check it out. A stunning record way ahead of their time, it is a shame that they split up.